Word2Vec (https://code.google.com/archive/p/word2vec/) offers a very interesting alternative to classical NLP based on term-frequency matrices. In particular, as each word is embedded into a high-dimensional vector, it’s possible to consider a sentence like a sequence of points that determine an implicit geometry. For this reason, the idea of considering 1D convolutional classifiers (usually very efficient with images) became a concrete possibility. As you know, a convolutional network trains its kernels so to be able to capture, initially coarse-grained features (like the orientation), and while the kernel-size decreases, more and more detailed elements (like eyes, wheels, hands and so forth). In the same way, a 1D convolution works on 1-dimensional vectors (in general they are temporal sequences), extracting pseudo-geometric features. As it’s possible to see, the resulting vectors have different directions, because the words “good” and “bad” have opposite representations. This condition allows “geometrical” language manipulations that are quite similar to what happens in an image convolutional network, allowing to achieve results that can outperform standard Bag-of-words methods (like Tf-Idf). To test this approach, I’ve used the Twitter Sentiment Analysis Dataset (http://thinknook.com/wp-content/uploads/2012/09/Sentiment-Analysis-Dataset.zip) which is made of about 1.400.000 labeled tweets. The dataset is quite noisy and the overall validation accuracy of many standard algorithms is always about 75%. An initial embedding layer. This approach is the simplest, however, the training performances are worse because the same network has to learn good word representations and, at the same time, optimize its weights to minimize the output cross-entropy. I’ve preferred to train a Gensim Word2Vec model with a vector size equal to 512 and a window of 10 tokens. The training set is made up of 1.000.000 tweets and the test set by 100.000 tweets. Both sets are shuffled before all epochs. As the average length of a tweet is about 11 tokens (with a maximum of 53), I’ve decided to fix the max length equal to 15 tokens (of course this value can be increased, but for the majority of tweets the convolutional network input will be padded with many blank vectors). The training has been stopped by the Early Stopping callback after the twelfth iteration when the validation accuracy is about 79.4% with a validation loss of 0.44. The previous model has been trained on a GTX 1080 in about 40 minutes. Reuters-21578 is a collection of about 20K news-lines (see reference for more information, downloads and copyright notice), structured using SGML and categorized with 672 labels. They are diveded into five main categories: However, most of them are unused and, looking at the distribution, it’s possible to notice a complete lack of homogeneity. I tried your code on sentiment140 data set with 500,000 tweets for training and the rest for testing. I get about the same result as you on the validation set but when I use my generated model weights for testing, I get about 55% accuracy at best. Do you know what could be causing it? In a deep model, the train size should be very large (sometimes also 95% of set). I think you’re excluding many elements. Which is your training accuracy? If it’s quite higher than the validation acc, you’re overfitting. Try with a larger training set and a smaller for testing. I just noticed that I am also creating a new word2vec when tesing. Do you think that could be a problem? Should I try and save my word2vec model while training and reuse it when testing? I cannot reproduce your code right now, however you must use the same gensim model. The word embeddings could be completely different due to the random initializations. Moreover you can lose the correspondence between word embedding and initial dictionary. Yeah, I figured the same. I will give this a shot and get back to you. Thanks! On line 76, you create a word2vec object by putting in the entire tokenized corpus through the function. Then, from line 119 you perform the train-test split. From my understanding, word2vec creates word vectors by looking at every word in the corpus (which we haven’t split yet). So in effect, your model could be biased as it has already “seen” the test data, because words that ultimately ended up in the test set influenced the ones in the training set. Can you explain why this is so? Please correct me if I’m wrong, but I’m a little confused here. The word2vec phase, in this case, is a preprocessing stage (like Tf-Idf), which transforms tokens into feature vectors. Of course, its complexity is higher and the cosine similarity of synonyms should be very high. Moreover, they are prone to be analyzed using 1D convolutions when concatenated into sentences. However, the model itself (not word2vec) uses these feature vectors to determine if a sentence has whether a positive or negative sentiment and this result is determined by many factors which work at sentence-level. The initial transformation can also be done in the same model (using and Embedding layer), but the process is slower. On the other side, word2vec has to “know” also the test words, just like any other NLP method, in order to build a complete dictionary. If you exclude them, you can’t predict with never-seen words. You’re correct when you say that they influence each other, but the skip-gram model considers the context, not the final classification. In other words: “Paris”, “London” and “city” can be close (in terms of cosine similarity), but it doesn’t mean that they can directly affect the sentiment analysis. Maybe there’s a sentence saying: “I love the city of Paris” (positive sentiment) and another saying “I hate London. It’s a messy city” (negative sentiment) (I love both :D). So, I don’t think about a bias. Maybe the model could be improved in terms of capacity, but it doesn’t show either a high bias or high variance. I hope my viewpoint was clear. It’s a very interesting conversation! I have a question, no pre-trained glove model is used on which to create the word2vec of the whole training set? if I understand your question, the answer is no. The W2V model is created directly. Hi,i have few questions and since i am new to this they might be basic so sorry in advance. 1-I am getting “Memory error” on line 114,is it hardware issue or am i doing something wrong in code? 2-line number 33,what does it refer to? 3-If i train my model with this dataset and then want to predict for the dataset which are still tweets but related to some specific brand,would it still make sense in your opinion? 4-If i want to add LSTM (output from the CNN goes into LSTM for final classification),do you think it can improve results?If yes,can you guide a bit how to continue with your code to add that part?Thanks alot! 3. You should consider the words which are included in the production dataset. If they are very specific, it’s better to include a set of examples in the training set, or using a Word2Vec/GloVe/FastText pretrained model (there are many based on the whole Wikipedia corpus). 4. I’m still working on some improvements, however, in this case, the idea is to use the convolutions on the whole utterance (which is not considered like an actual sequence even if a Conv1D formally operates on a sequence), trying to discover the “geometrical” relationships that determine the semantics. You can easily try adding an LSTM layer before the dense layers (without flattening). In this case, the input will have a shape (batch_size, timesteps, last_num_filters). The LSTM output can be processed by one or more dense layers. 1-As far as i can understand word2vec model is trained till like line 87,after that,the separation of training and test data is for CNN ,is my understanding right? 2-I wanted to run and see what exactly X_train looks like but i couldnt run it so i am assuming from dry run that its a matrix containing index,words and their corresponding vectors.If my understanding is right,then it means CNN takes 15 words as an input each time(which might or might not be the whole tweet) so when i make predictions how will it make sure that prediction is for one whole tweet? 3-I was thinking to use another dataset as well which is similar to one for which i want to make predictions for(e.g.phones) for training word2vec since it doesnt need labelled data and it will probably just increase dictionary.But i am concerned that CNN or CNN+LSTM wont be able to learn anything since i couldnt find any labelled dataset related to phones so if someone says there camera is 2MP vs someone who says 30MP,it wont be able to differentiate that the 2MP one is probably negative sentiment and 30 one is positive.Do you think that i should try to make predictions only if i have labelled dataset for that particular domain? 4-In LSTM timestamp according to me is how many previous steps you would want to consider before making next prediction,which ideally is all the words of one tweet(to see the whole context of the tweet) so in this case would it be 1?since CNN takes 15 words which is almost one tweet.Last_num_filters i think is based on feature map or filters that you have used in CNN so e.g. if in your code you did 8,would this be 8? Sorry for really lengthy post and hope i make some sense atleast. I am a beginner in the field of machine learning and I’ve been trying to understand this code. I would like to know how can we predict the sentiment of a fresh tweet/statement using this model. It’ll be really helpful if you could attach the code too! In other words, you need first to tokenize the tweet, then lookup for the word vectors corresponding to each token. However, I’m planning to post a new article based on FastText and I’m going to add a specific section for querying the model. unfortunately, I can’t help you. You don’t enough free memory. 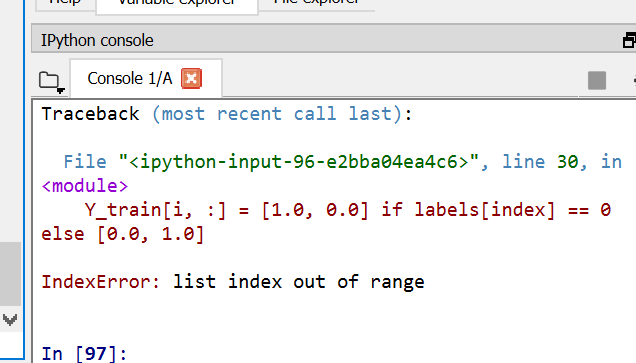 Try to reset the notebook (if using Jupyter) after reducing the number of samples. You can also reduce the max_tweet_length and the vector size. Consider that I worked with 32 GB but many people successfully trained the model with 16 GB. Hi .. it’s worked with 100.000sample but very slow .. I have another question .. how can I fed a new review to get it’s sentiment predict ? 1- when I trained your model in my own NON ENGLISH corpus, I got unicode error so I tried to fix it with utf8 but it doesn’t work anymore, Do you have any idea to solve it? 2- I wanna know whether your word2vec model works properly in my own English corpus or not Is there any code to show word2vec output vector to me?? Word2Vec works with any language. If you are experiencing issues, they are probably due to the charset. Unfortunately, I can’t help you, but encode(‘utf8’) and decode(‘utf8’) on the strings should solve the problem. Alternatively, try other charsets, like ISO-8859-1. The model is binary, so it doesn’t make sense to try and read it. If you want to test it (considering the variable names used in the example), you can try X_vecs.similarity(‘word1’, ‘word2’) with a couple of test words (e.g. ‘king’ and ‘queen’). Instead, the word vectors can be retrieved as in a standard dictionary: X_vecs[‘word’]. Clearly, check whether the term exists before trying to read the vector. Thanks for you’r clear explanation. I completely got it. .. Omgaga. Im sooo im gunna CRy. I’ve been at this dentist since 11.. I was suposed 2 just get a crown put on (30mins)…. I can’t understand why do they have this different and i really get confused! 2-Is it that important to have tokenize and stem as a preprocessor in sentiment analysis?? I mean can I train my model without these preprocessor, in other words get the corpus directly to the word2vec model and the result will be passed for training, is it possible?? When using Word2Vec, you can avoid stemming (increasing the dictionary size and reducing the generality of the words), but tokenizing is always necessary (if you don’t do it explicitly, it will be done by the model). The differences are due to different approaches (for example, a tokenizer can strip all punctuation while another can keep ‘…’ because of its potential meaning). NLTK offers different solutions and I invite you to check the documentation (this is not advertising, but if you are interested in an introduction to NLP, there are a couple of chapters in my book Machine Learning Algorithms). I’ve asked this question in other comments. However, you need to tokenize your sentence, creating an empty array with the maximum length employed during the training, then setting each word vector (X_vecs[word]) if present or keep it null if the word is not present in the dictionary. At this moment, I’m quite busy, but I’m going to create an explicit example soon. and the same for the testing – All i did was to change what i said – Is it right? Hi, you also need to modify the output layer of the network. Right now it’s a softmax and [1, 1] cannot be accepted. Try using a sigmoid layer instead. Alternatively, you need to assign [0.5, 0.5] to the neutral sentiment. Softmax must represent a valid probability distribution (so the sum must be always equal to 1). I assign in such way: Y_test[i – train_size, :] = [0.5, 0.5] and I although that i understood in this way i can use softmax , I use sigmoid – All I did was what i said – I didn’t add new neural or anything but the code can’t predict any neutral idea – Do you have any suggestion ?? Hi, with (0.5, 0.5) you should use softmax. Indeed, any output which is close to (0.5, 0.5) is implicitly a neutral. However, do you have neutral tweets? You should have a dataset made up of 33% positive, 33% negative, and 33% neutral in order to avoid biases. i see [0 0] in the output !!!!!! Do know why?? Y_test[i – train_size, :] = [0.0, 0.0,0.1] consider that i do the same for positive and negative too – honestly I did that but I can’t get the properly result so I want to know whether this might some logical problem or something from my corpus …. Hi – I’m new in this field so I get confused for a basic issue. Why doesn’t your model use classifier training method such as training and testing the Naive bayes Classifier? Is it ok to only choose randomly training and testing data set among the corpus??Why? Hi, this is a model based on word vectors that can be more efficiently managed using NN or Kernel SVM. However, you are to test any other algorithm (e.g. a Gaussian Naive Bayes) and select the solution the best meets your needs. In any model, the dataset is supposed to represent a data generating process, so randomly sampling from it is the optimal way to create two subsets that are close (not exactly overlapped) to the original probability distribution. A non-random choice can bias the model, by forcing it to learn only some associations while other ones are never presented (and, therefore, the relative predictions cannot be reliable). Does the model of initialing Y_test have any effect on the learning or what?? Hi. I ran your code with my own balanced dataset and when I wanted to predict sentences, my model predict all sentences as negative!!! I was suffering the internet for days but I can’t fix my problem. Do you have any idea to help me? BTW my corpus contain 9000 sentences with equal amount of + and – . Have you retrained both the Work2Vec and the network? If yes, you should have seen the validation performances on a test set. If you haven’t, it probably means that there are strong discrepancies between the two training sets. Sorry would you mind explaining more? I think I’m kinda misunderstood since I’m new in this field. How can I should see the validation performance? and about Word2Vec yeah I’ve retrained it. As you can see, the validation accuracy (val_acc) is 0.7938. This means that the classifier predicts correctly about 80% of labels (considering the test set, which contains samples never seen before). Check your validation accuracy. In the case of low values (<0.5, which is a random guess), start increasing the number of epochs. If it doesn’t’ work, assuming that your dataset is balanced, try with different architectures (e.g. more Dropout and more layers). I gonna do what you said but when I look may val-acc I think the result is kinda strange.Do you have any idea? you see my balanced corpus contains 9100 sentences which I used it as I mentioned above. and this is my result!!!!!!!!!!!!! The result is not strange at all. It simply shows a mistake: the test set is made up of samples belonging to the same class and, hence, it doesn’t represent the training distribution. It’s clearly impossible to have 0.63 training accuracy and 1.0 validation accuracy. Shuffle your dataset before splitting and, possibly, enlarge your test set (e.g. 1000 samples). Thank you for your clear explanation. But i’m kinda misunderstood,hope to help me. right before splitting we use word2vec so when should we shuffle our data?? I mean should we shuffle exact tweet or do it after using embedding method such as word2vec? In this way, the sets are shuffled. From your error, I suppose you’re feeding the labels (which should be one-hot encoded for a cross-entropy loss, so the shape should be (7254, num classes)) as input to the convolutional layer. Honestly, I don’t know how to help you. The input shape should be (num samples, max length, vector size), hence check if X has such a shape before splitting. Moreover, as the output is binary, Y should be (num samples, 2). For example, positive (1.0, 0.0) or negative (0.0, 1.0). Excuse me why don’t you separate your corpus into 3 parts as training testing and validation?? The subdivision into 2 or 3 blocks is a choice with a specific purpose. If the dataset is assumed to be sampled from a specific data generating process, we want to train a model using a subset representing the original distribution and validating it using another set of samples (drawn from the same process) that have never been used for training. In some cases, it’s helpful to have a test set which is employed for the hyperparameter tuning and the architectural choices and a “final” validation set, that is employed only for a pure non-biased evaluation. In both scenarios (2 or 3), the goal is the same and the only very important condition is that all 2/3 sets must be drawn from the same distribution. Of course, feel free to split into 3 sets if you prefer this strategy. In your architecture how many hidden layer did you use? and the number of neuron in each layer is 32?? am i right? how can you know which number of layer would be beneficial for your model? in a convolutional network, it doesn’t make sense talking about neurons. In this case, there 8 layers (separated by a dropout one) with 32 (3×1) kernels (with ELU activation), followed by 2 dense Tanh layers with 256 neurons and a softmax output layer with 2 units. In general, it’s helpful to start with a model with smaller models, checking the validation accuracy, overfitting, and so on, and making a decision (e.g. adding new layers, increasing or decreasing the number of units, adding regularization, dropout, batch normalization, …). The golden rule (derived from the Occam’s razor) is to try to find the smallest model which achieves the highest validation accuracy. An alternative (but more expensive) approach is based on a grid-search. In this case, a set of models based on different parameters are trained sequentially (or in parallel, if you have enough resources) and the optimal configuration (corresponding to the highest accuracy/smallest loss) is selected. Normally this approach requires more iterations because the initial grid is coarse-grained and it’s used to determine the sub-space where the optimal parameter set is located. Then, several zooms are performed in order to fine-tune the research. would you please tell me how many hidden layer did you use in your model? Count the number of layers added to the Keras model (through the method model.add(…)) excluding all “non-structural” ones (like Dropout, Batch Normalization, Flattening/Reshaping, etc.). In this case, there are 11 layers (considering also the output one). I highly recommend studying the basic concepts of Keras, otherwise, it’s impossible to have the minimum awareness required to start working with the examples. Hi. I wantvto know is it possible to inject some handcrafted feature to cnn layers?? I eant to use only convolutional natwork nor svm and … is it possible to combine both kinds of features?? And i think i should inject hand-crafted features into the fully connected layer but i donk know how? Can you help me please? What do you mean with injecting “handcrafted” features? Are you talking about data-augmented samples? it clearly means that the list/array contains fewer elements than the value reached by the index. Check the dimensions (using x.shape for arrays or len(x) for lists) before starting the loops or using indexes.